Until October 2001, aged 41, Justin had been very fit and healthy. He then started to develop a series of seemingly unrelated ailments. Strange rashes appeared, his joints seized up and his nail beds became infected. At one point he had over 100 mouth ulcers. His doctor was not able to help. By March 2003 Justin was very ill and losing weight. His sister took him to the local accident and emergency department where Justin was admitted to hospital. After a few days of investigations it became clear that his large intestine (colon) needed to be removed. This tissue was sent to the pathology laboratory, where it was diagnosed that Justin had Crohn’s disease. About a week after the surgery, Justin’s recovery ran into problems. As the complications mounted, Justin was moved into intensive care, then transferred to St. Mark’s Hospital for more specialist care. That first hospital visit lasted 8 months. Most of the following four and a half years were spent in hospital recovering from further surgery to correct abscesses, adhesions, collections, infections, fistulas (nasty) etc etc. When not in hospital Justin was being looked after by his family and awaiting further surgery. By 2006, and after a lot more surgery, Justin had lost most of his small bowel too (short bowel syndrome) and needed total parenteral nutrition (TPN) in order to survive. This is a lifelong condition, requiring administration of liquid intravenous nutrition. To achieve this, Justin has a life support system at home, to which he is connected for 12 hours a day. Justin has been taught to self-manage this treatment. The liquid nutrition is stored at between 2 and 8 degrees in a dedicated fridge and is delivered weekly to Justin’s house by Bupa. Since his last abdominal surgery in August 2007 Justin has completed a BSc Psychology at the University of Portsmouth. In March 2009, however, Justin had a heart infection which led to a stroke and the need for open heart surgery. Because of this he needed to take a year off from university. Having completed his psychology degree in June 2011, Justin switched to the University of Brighton to take an MSc in Occupational Therapy. If all goes well, Justin will be a qualified occupational therapist by the time the Gutless Kayaking crew take to the water again in September 2013. If everything goes really well, then someone will have offered Justin a job in occupational therapy to coincide with the completion of this paddle. 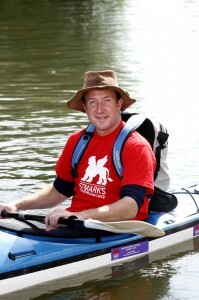 Read about the other paddlers on this trip.